At least three people have been injured in new protests in northern Afghanistan against Nato raids, reports say. The nature of their injuries is unclear. Reports say police opened fire with water cannon and fired in the air. On Wednesday at least 12 people were shot dead in Taloqan during protests against a Nato-led night raid near the city in which four people were killed. Nato said all four were insurgents, but locals insist they were civilians. Nato night raids have angered many Afghans. The demonstrations in normally peaceful Takhar province erupted hours after news emerged of the deadly raid on Tuesday night. President Hamid Karzai has despatched a high-level delegation to find out how the four - all members of the same family - were killed. About 2,000 protesters looted shops and tried to attack a German army base before order was restored on Wednesday. 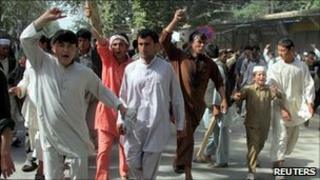 As well as those killed, at least 80 people were injured in the clashes with security forces. Thursday's smaller protest saw the police chief's compound attacked. Two rooms were set alight, reports said. "Three of the demonstrators were injured and taken to the hospital and the fire was put out," a provincial government spokesman Fayez Mohammad Tawhidi told AFP news agency. The BBC's Bilal Sarwary in Kabul says hundreds of shops in Taloqan are closed and the situation is now calm. A senior official told the BBC that elite troop reinforcements were guarding key installations and controlling the city's entry and exit points. At least 40 arrests have been made in connection with the protests, officials say. "They were mostly agitators who wanted to take advantage of the situation," a security official told the BBC. Our correspondent says Takhar, which borders the Central Asian republic of Tajikistan, falls on a route notorious for drug smuggling. The province's remote and inaccessible areas are considered perfect hiding places by drug dealers and insurgents. Intelligence officials say the Islamic Movement of Uzbekistan, which has close links with the Taliban, has become active in Takhar in recent years. Taliban and al-Qaeda activists are known to operate in neighbouring Kunduz province. President Hamid Karzai has condemned Tuesday night's raid on the outskirts of Taloqan, saying the Afghan government had repeatedly warned Nato "about such irresponsible operations". He has asked Nato to explain the "exact circumstances of the incident". The Afghan authorities say the raid was conducted unilaterally by Nato. But the alliance says it was a joint operation with Afghan forces and that the Takhar provincial governor was told about it before it took place. The Nato-led mission says that two women and two men were killed. It said that the women were armed, one with an assault rifle, the other with a pistol. Female insurgents are rare, but not unheard of in Afghanistan. BBC correspondents say that night raids are deeply unpopular, but have been effective at finding and killing insurgent commanders.